Bronx, NY – Well, well, well — J. Prince has somehow managed to get YBN Almighty Jay’s stolen Rap-A-Lot chain back. In a recent Instagram post, the Rap-A-Lot founder shared a photo of himself with his son J. 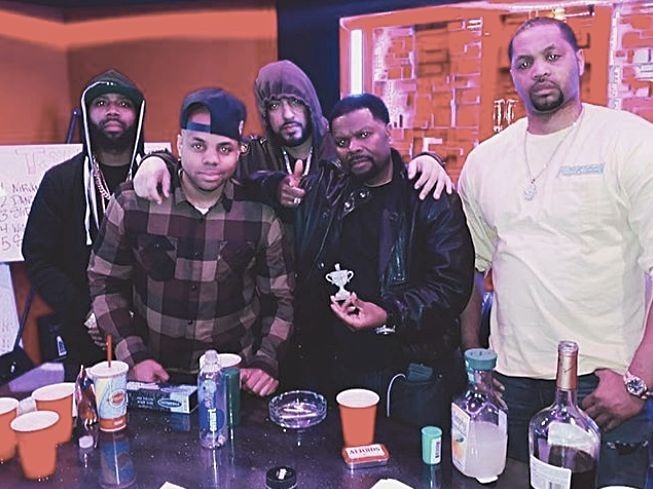 Prince Jr., French Montana and Hocus 45th, among others, celebrating his son’s birthday. Prince is proudly displaying the jewelry in his hand. “Real recognizes real in every hood and has a way of connecting in spite of clowns and squares,” he wrote in the caption. “The homies from the Bronx, KT, @hocus45th and @frenchmontana kept it real with me and my son @jprincejr. Tho it was never about the chain, it was about the name that was built off of blood sweat and tears. I welcome these brothers to our #MobTies movement and look forward to us doing business in the future together. Almighty Jay was attacked and robbed in New York City earlier this month. During the melee, somebody broke a Hennessy bottle over his head, requiring the 19-year-old Houston native to get 300 stitches in his face. The suspects made off with his wallet, shoes and the Rap-A-Lot chain. Upon hearing the news, Prince called out the alleged attackers — Zae Numbafive and his Jack Boyz crew — as part of an Instagram APB in an effort to get his fellow Bronx-bred industry figures to help solve the crime. Although it upset a few of the people who were tagged in the post, including Mysonne, it looks like Prince got the results he was looking for. Not only did he get the chain back, but Zae and three other Jack Boyz seemingly got their karma. Last week, they were arrested on unrelated attempted murder charges.